Beachwood Textured Papers. The book belonged to my mother, and the shells were collected on our trip to California this February. The blog board comes from EW Couture. Hello Mary! The Blue Hyacinths are lovely. Very pretty arrangement with the seashells.. Beautiful still life images. Thank you for hosting, wish you a happy new week! Very artistic photo collages, Mary. I love the soft colors and theme. What a pretty still life! I love the soft colors of the flowers and shells. Lovely my friend! And thanks for hosting! Hugs! I like the results when you play around with items to create a vignette. 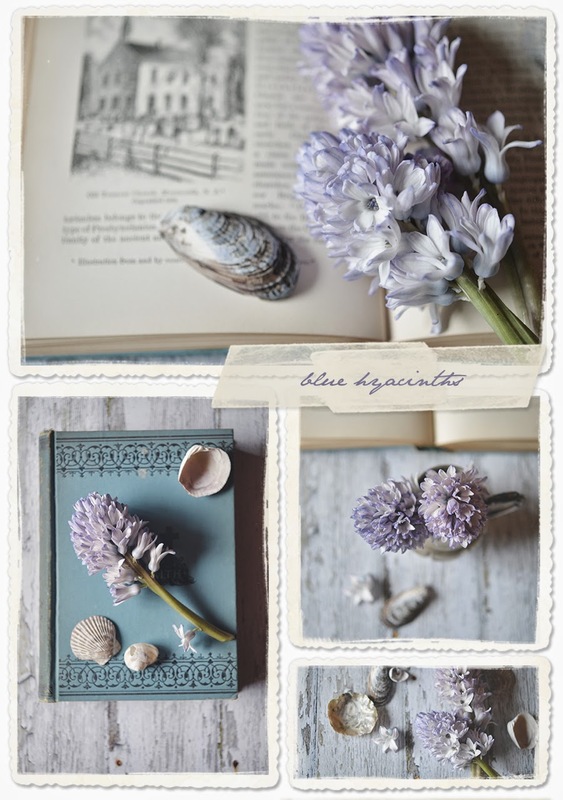 You certainly got some mileage out of the hyacinth bloom and it, along with shells is pretty on the blue book cover. Beautiful colors in a charming arrangement of flowers and shells! Have a great new week! Mary , I just love what you created.. Gorgeous as always. I checked out the boards and they are to die for and make. I can not stop thinking about making my own out of wood I hope I can find on this farm someplace. .. but I live with a husband that has to have everything perfect so he may have gotten rid of what I need. Im on the hunt this spring. Thanks for the inspiration always.. Always you do. A Kindred Soul.. Happy Spring Mary. New things and growth to you. Such a gorgeous composition! Thanks for the link up! oh my goodness your post today has opened up a whole new world! I absolutely love those "wood" backgrounds. It is something I have been searching for. What a great idea to photograph old boards and then use them as a background. I have been to Sarah's site and her work is so gorgeous. I have trouble doing soft and dreamy but her work is inspiring me. 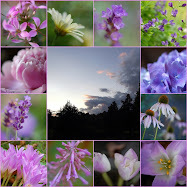 Thank you so much Mary for your post and for hosting Mosaic Monday - it is always the most perfect start to my week. Your still life compositions are beautiful, Mary. I do love the faded colour of your hyacinths, one of my favorite spring flowers. Thank you for hosting Mosaic Monday! As usual your pictures are lovely. Lovely photos. The faded blue is very on-trend for spring. Thank you Mary. A treat to see the Blue Hyacinths. Have a lovely week. Beautiful Mary. I love how you put this post together. Lovely. I always enjoy your flower still lifes. Dear Mary, it won't be long I'll have those Blue Hyacinths in my yard. Come on Spring.